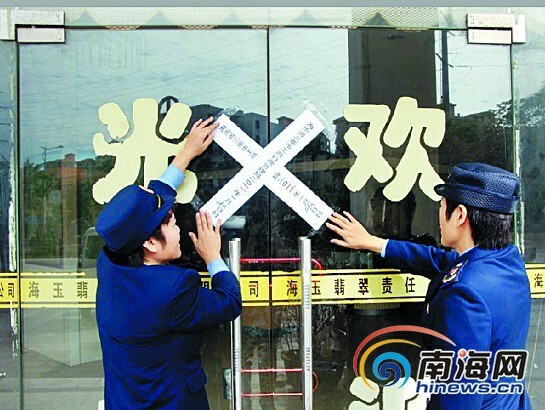 Recently a jade store was investigated for ripping off tourists buying low-quality jade products and had its business license suspended by the Bureau of Industry & Commerce in Sanya on Jan 28, 2011, reports 0898.net. According to a tourist, he was traveling in Sanya with a package tour and led by a guide to the Hai Yu Jade Store located at Jinjiling Road. They were arranged to a VIP room where a hostess gave a presentation on jade knowledge, when the owner of the store came in with a big smile on his face. He told tourists his wife gave birth to twin sons. For praying of his two baby twins, the owner decided not to sell the jade products to the Chinese customers, which usually sold at a high price to Japanese and South Korean customers. He asked the shop manager to educate the tourists about the professional knowledge of identification of jade products. After returning home, the tourist entered the identification code in the package on the website. Based on suspicion, he immediately took what he bought to the local jewelry identification department and was disappointed to find that what he bought was a very low-quality jade product. After receiving the complaint, the local Bureau of Industry & Commerce immediately initiated an investigation on the jade store and ordered the store owner to refund the full payment to the customer. Experts said that while customers are purchasing jewelry products it is important to go to authorized stores and ask for relevant certificates.